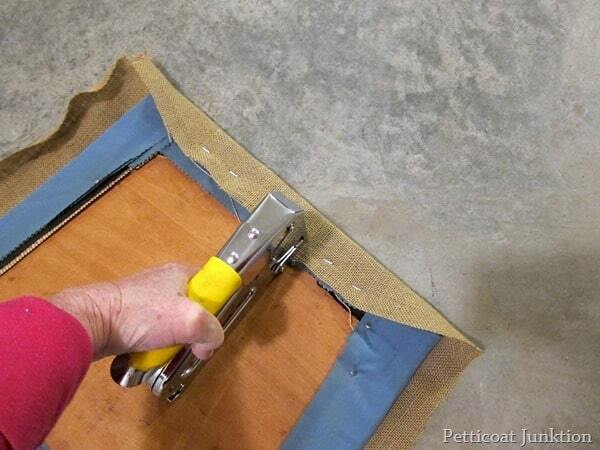 Let me show you how to cover a chair seat. I promise you it’s a simple task and doesn’t require any power tools or expensive items. I re-covered this chair seat which is part of the desk and chair/computer/laptop cabinet projects. This is the chair I selected to go with the soon to be newly painted computer desk. I don’t even remember where I purchased the chair. It’s been in the workshop forever. 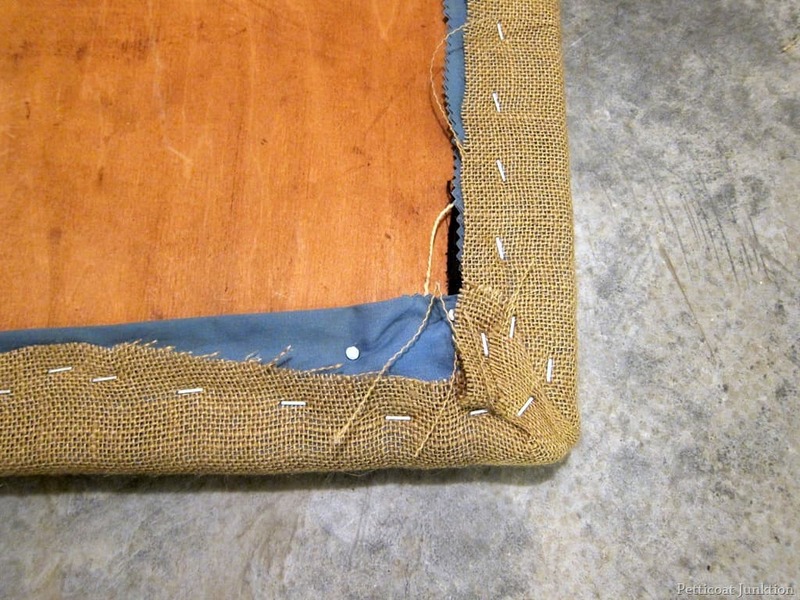 It’s really easy to cover a chair seat, or maybe I should say re-cover. First thing to do is turn the chair upside down and remove the seat. All you need is a screwdriver. 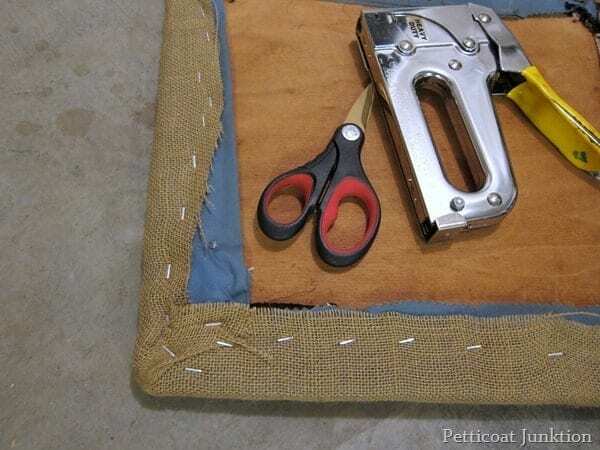 Next you’ll need your fabric, a pair of scissors, and a heavy duty staple gun. I decided to use burlap to cover the chair seat. I bought the burlap a few months ago. I can’t remember what project I bought it for but I never used it. This isn’t the regular utility burlap that I hang in my booth or use as a photo backdrop. 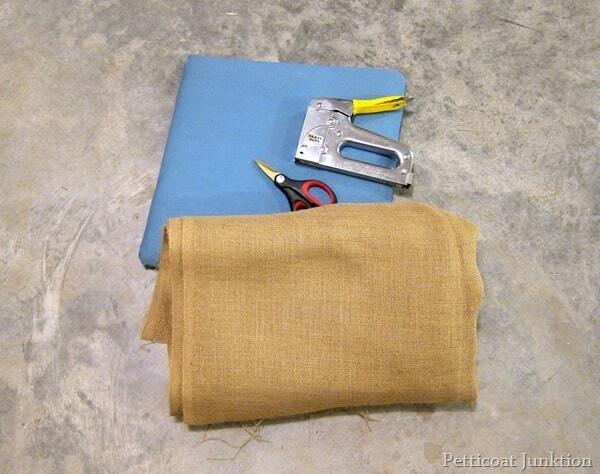 It has a tighter weave and doesn’t have the strong odor that the other burlap does. Lay your chair seat on the fabric and cut the fabric large enough to wrap around the seat bottom. Next staple the fabric to the seat. Staple one side of the seat then do the opposite side. Next do the other two sides. Pull the fabric tight as you staple each side. Go overboard on the staples!! The more the better. I use 5/16” size staples. Do the four corners last. 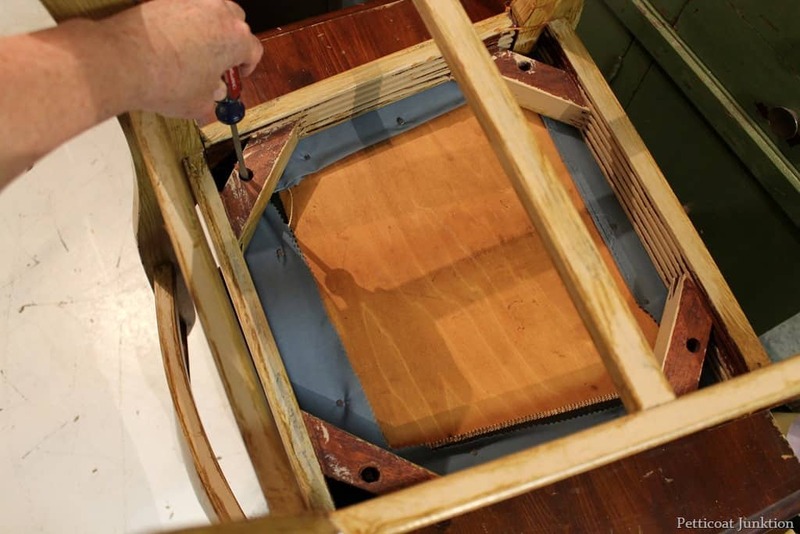 You cant’ really show this process in a photo. Every fabric you work with is different. 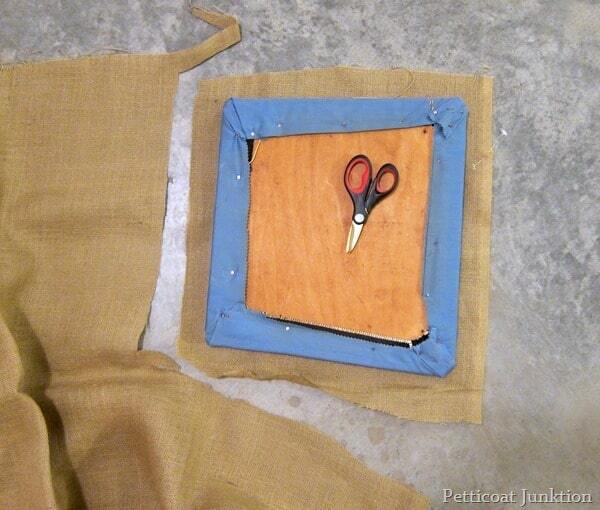 The way you work the corners will depend on the thickness of the fabric and also how much give the fabric has. You just have to play with it and try to smooth the fabric so you don’t have a lot of pleats showing on the corners or top of the seat. See how nice and neat it looks. The entire project takes about an hour…tops! I didn’t photograph the entire chair because I don’t want to ruin the desk and chair reveal. Haven’t finished the desk yet! 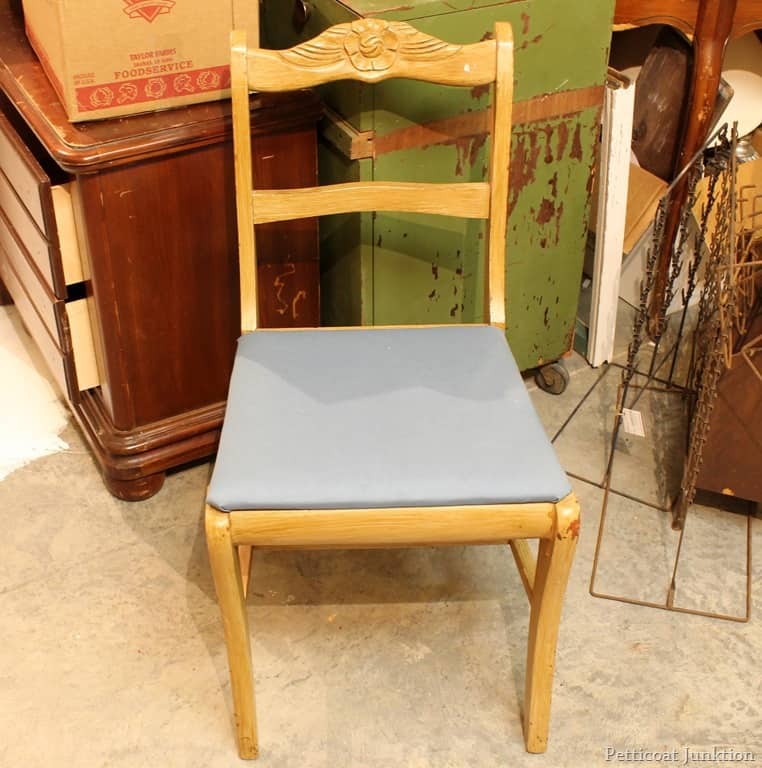 Painting a chair like this one and re-covering the seat is really easy. 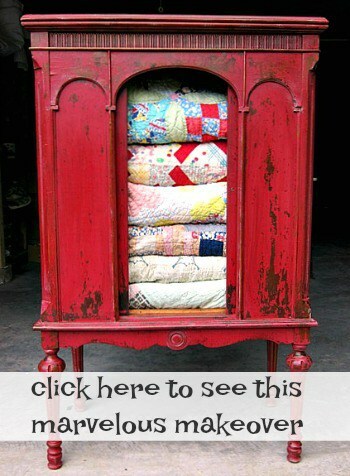 I’ve used old drapery panels, pillow cases, drop cloths, skirts (really! ), and recycled fabrics to cover chair seats! Did you learn anything from this how to cover a chair seat tutorial???? If you’ve recovered chair seats, maybe you have some tips you want to share? I bought a few chairs, but the seats are so hard. What should I do when I recover them to make them a lot more comfortable? Padding? This looks beautiful! Very thorough instructions too. Thanks for sharing! And it sounds like you had a great spring break – just the way it is supposed to be – relaxing! 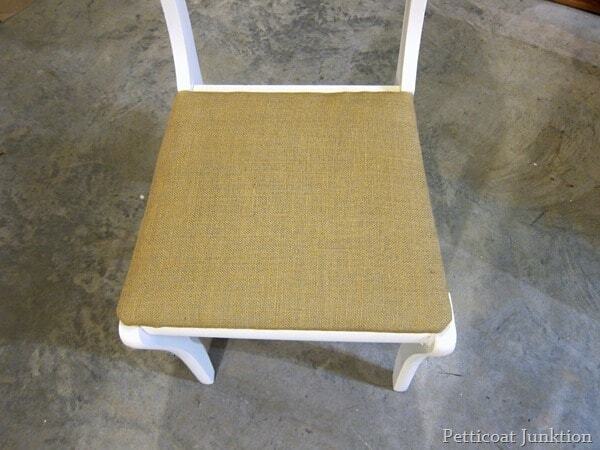 Isn’t it amazing the difference new fabric can make on a chair? 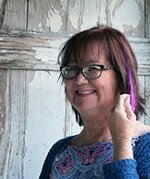 Love your tips for a good recover seat Kathy! Your ‘fancy’ burlap makes the chair complete! And, I totally agree on the go overboard on the staples…better too many than not enough.